excepting for the icons, the layout was generated programatically with simple and plain Morphic objects. The "Territory Builder" uses a wizard library called Merlin and it is based in a Territorial library which basically is a Composite pattern implementation to build complex territorial objects. I have integrated the Help in just one hour, based in the HelpSystem without any previous knowledge of the library. The main module window is a "Case Study Browser" implemented with the OmniBrowser framework. From the browser one can create and associate several phylogenetic data to a species case study, classify according to defined territories and then export results into formats like Arlequin, Google Fusion Tables or Fluxus Network. 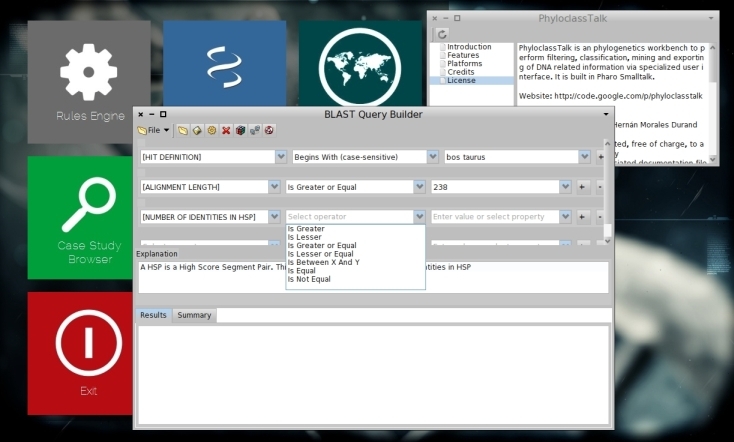 The following screenshot describes the "Blast Query Builder", which enables dynamic generation and execution of Blast XML results, producing filtered objects which can be later loaded in the case study browser for further associations. Fitered results could be cumulative, meaning that each new execution is applied on the previous results. Detailed features as the rule engine protocol and the post-curation of classified data are going to be described an the upcoming paper. I will provide also new posts on this front as I prepare a release, stay there online. Time to talk about the new 0.4 release. BioSmalltalk virtual-images include basic developement libraries for doing bioinformatics, for example XML APIs, OS services, HTTP requests, serialization, refactoring, etc. 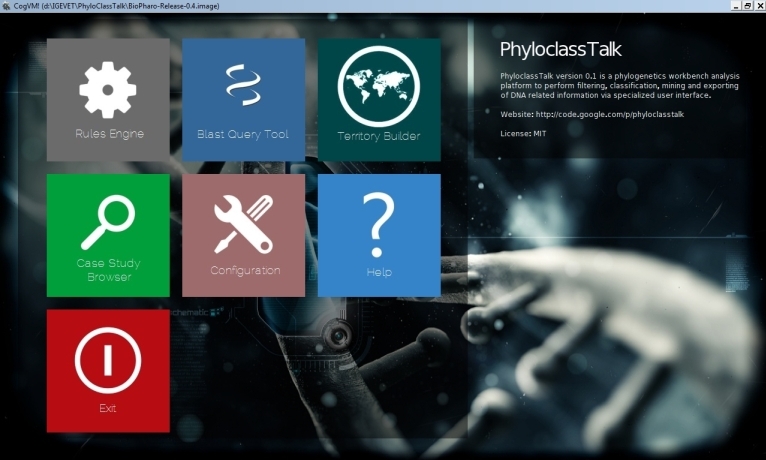 Both BioPharo and BioSqueak are editions of BioSmalltalk and includes specific platform packages, as all Smalltalk platforms evolves on their own. There are separate downloads for different OSes: Windows, Linux and MacOS X. And there are different "Editions" which currently are: Pharo 1.4 and Squeak 4.4. Main developement is happening in Pharo 1.4. The Squeak edition is experimental and does not contain menu entries for targeted browsing and updating. Please feel free to comment or register into the mailing list provided by Google Code hosting.